A quarter of all strokes occur in the posterior circulation but this area has been neglected compared with carotid territory stroke. In prospective studies, in collaboration with Professor Rothwell’s group at Oxford, we have shown symptomatic vertebral artery stenosis is associated with a high risk of early recurrent stroke. 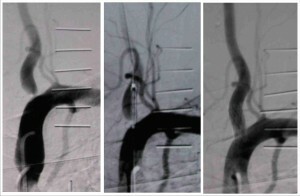 Hugh Markus is PI for the Vertebral artery Ischaemia Stenting Trial (VIST) which is examining whether stenting is more effective than best medical treatment for patients with both symptomatic extracranial and intracranial stenosis. After initial feasibility study of 100 patients the trial has now been extended to Europe and Australia. We welcome new centres (please contact VIST@sgul.ac.uk) .